To help you easily sort all kitchen waste for recycling purposes, here comes a set of 8 self-adhesive labels to identify your small home containers. Tired of picking trash out of your recycle bin? These stickers will help you and your family stay organized. To facilitate the indoor management of selective waste sorting and the transfer into outdoor bins, we have designed nice labels for each category of recyclable materials: a green one for glass, a yellow one for metal, a red one for plastics, a blue one for paper. It's so much easier to put all compostable organic waste in a small bucket next to the sink, before emptying it into the big backyard composter outside! That's why we made this red label for reusable food waste. 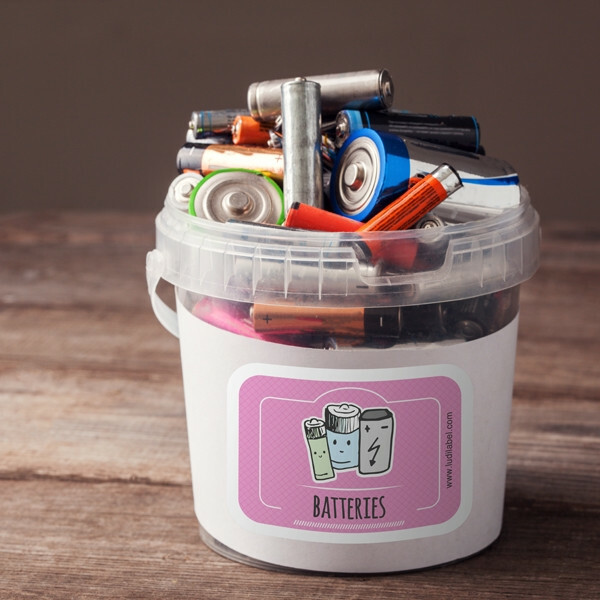 We also include in this collection, a black label to tag the bin containing non-recyclable materials and non-compostable organic waste, and two labels to mark your used battery boxes and used bulbs! 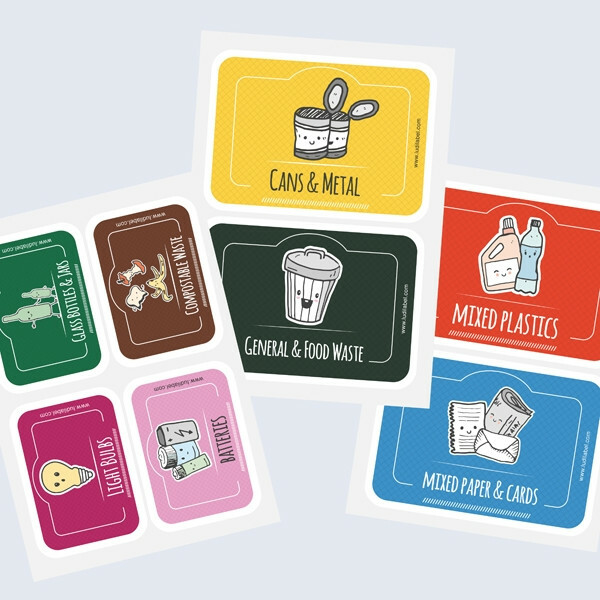 A waste sorting sticker for each category. These stick-on labels are perfect for small indoor bins, whether they are in stainless steel or in plastic. More and more people are eager to do their part to reduce their impact on the environment by recycling home waste. 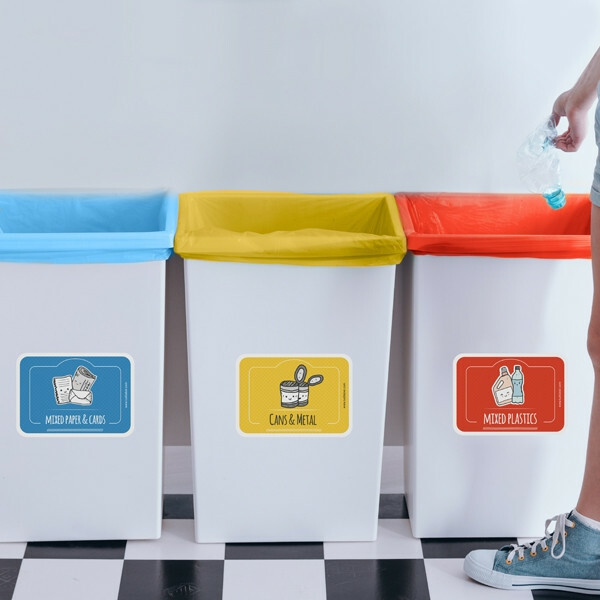 Having 5 small rubbish bins for waste management may seem like a lot for some homes, but it's a simple solution to educate the entire family and guests about sustainable development. By sorting recyclable materials from non-recyclable materials, we quickly become aware of over-packaging, and at the time of shopping, we have learned to choose packaging that is recycled, recyclable or to reduce our consumption of materials. Suitable for every models of containers! Caution: Our self-adhesive labels allow you to label your small home bins to organize the pre-sorting of your waste. We advise you to follow the sorting instructions of your municipality before disposing your home waste into the collection bins located outside, in order to facilitate the work of people involved in the recycling process. How customers use our labels ? Samantha would like to go zero waste by reducing consumption but she has trouble figuring out the quantity and variety of garbage produced by her home. She decides to apply selective waste sorting and she labelled her garbage bins in the kitchen to better separate her waste. Using our labels for small containers, she visualizes how to consume better to reduce her impact and she even decides to compost! An easy and practical set up with our pretty labels on! Olivia and Ahmed want to sort better so that a maximum of waste is recycled. At home the procedure is already well-honed when it comes to separate their waste at home. They have the 6 small waste bins in the kitchen but are trying to label them. No more home-made crafty labels glued to the bins, they choose our pretty already printed stickers. A great idea to educate family and guests to participate in sorting waste, and to make small green actions for the planet. 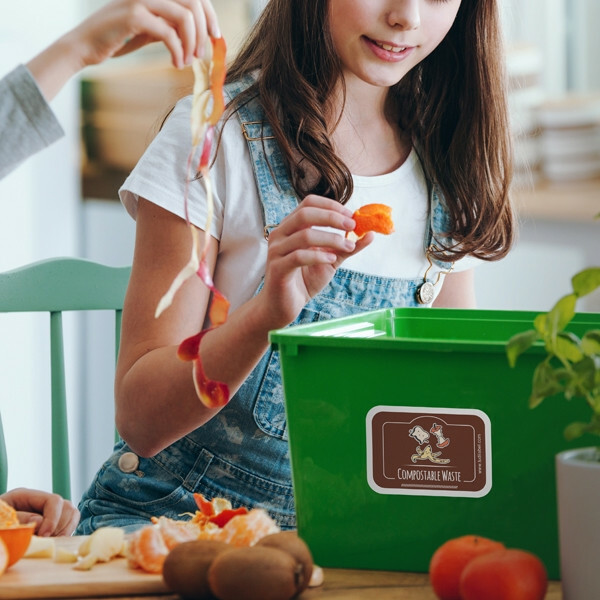 At school, the children of Jasmine and Oliver have learned the importance of waste sorting but food scraps are too often mixed with other recyclable waste. Since they have placed pictorial labels on waste bins and the garbage can, Yanis 7 years old and Lily 8 years old are more self-reliant and pay more attention. The whole family is motivated and even the teacher is now seduced by our waste sorting labels. A green label (14x10cm) for glass, bottles and jars and recyclable glass in general. A blue label for paper (newspapers, magazines etc ...) and cardboard. A black label (14x10cm) for garbage that does not recycle and does not compost. A small label (9,7x7cm) for used batteries. A small label (9,7x7cm) for burned out bulbs. Thoroughly clean the surface of the bin with clean products or washing-up liquid, in order to remove any grease. Peel the sticker off the sheet, and apply it directly on the sorting bin on a dry, clean smooth surface: rub with a clean cloth to make sure that the label is well stuck. Made with high-quality materials, these stickers are laminated and highly resistant to water for long-lasting adhesion and easy cleaning!